Many people ask me: "How do you source your great watches?" (well, if people did indeed ask me, then I'd tell them the following). Sourcing is one of the funnest parts of my obsession. The box of "chocolates" below are sourced, like many, from vintage shops. 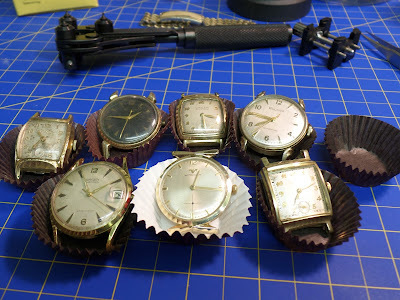 In this particular case, from not a box but a basket of 30 odd new, old and in between watches. But like a box of chocolates, you never know what you're going to get and what you think might be something great on the surface, well, it turns out not to be. The watches from the basket o'watches I found. 3 Gruen, 3 Bulova and a Wittnauer. Last week I returned to a vintage shop where I had previously seen a watch I thought I recognized but at the time decided to go back home to my computer and confirm my suspicions before purchasing. The day I first looked at it I didn't have a loupe (magnifying glass) with me and that would have made a world of difference to see the stamping on the outside of the watch case. Strangely, the vintage store had the worst loupe you could imagine - it didn't have much magnification power and it was so scratched up it was worse looking through it than using the naked eye. So, as it turns out, I did some internet search and determined that the watch I had looked at was likely 14k solid gold. For me, this would be a great addition to my collection considering solid gold watches for a person with an obsession can become expensive quickly. And the best part, the watches in this basket were all for $25. Yes, $25. So the next week I went back, I asked the clerk to look at the box of chocolates, errrr....basket o'watches and did not see it. While I was sorting through the watches the clerk said to me, "hey, there was a guy in here a couple of days ago and found a solid gold watch in there". Gadzooks, when you see it folks, buy it! Which brings me back to the chocolates in the picture above. I haven't felt comfortable bringing my loupe and watch case opener with me when looking (but now I will) so these particular watches in the picture I was taking a chance on. As it turns out, one of the watches (top row far right) was only a Bulova watch case and dial that had a replacement movement, one watch appears to have been in water for a very long time, and yet another is working beautifully and has watchmaker marks all over the inside of the case back indicating to me it was a well looked after watch. 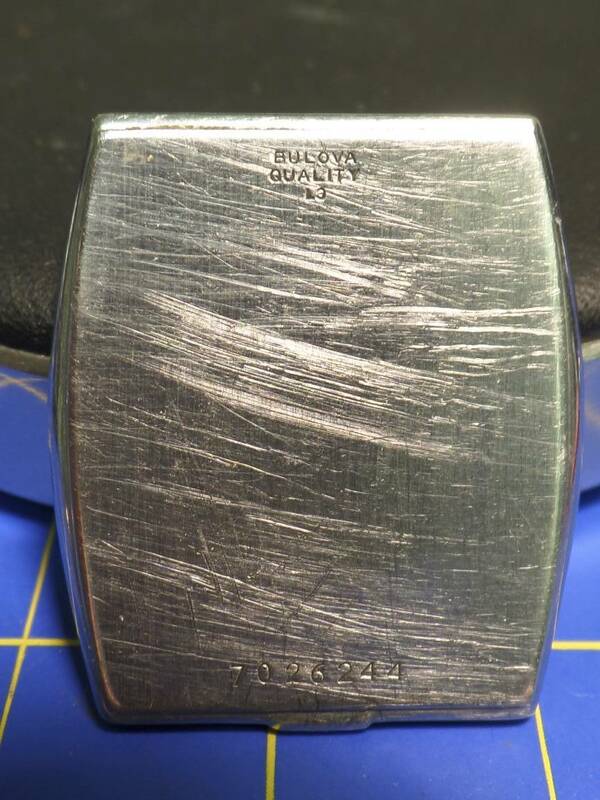 The Bulova pictured above had the mystery movement. I should have known by looking at the dial that said "self winding". A self winding watch has a rotor that moves back and forth from the motion of being on your wrist and winds the watch automatically. You can usually feel the rotor going back and forth if you have the watch in your hand and you rock it back and forth. Suppose that's what I should have done when considering buying this watch because as it turns out, it did not have a self winding movement inside the case. But, hey, at $25 I have a half decent case and a set of spare hands. I haven't been able to identify the generic movement. 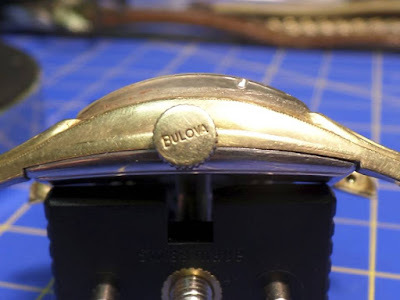 Like the Bulova with the mystery movement, the one above has an original Bulova crown (the knob you grasp to wind the watch). Depending how old the watch is, finding one with the original crown can sometimes be hard to find as they wear and are often replaced. This particular watch from my box also has a decent watch case and the movement seems to be in good shape. A parts watch or a contender for restoration. Again, not bad for $25. The two shots above are from one of the Bulova watches. You might be able to make out "L3" stamped on both the case back and the movement. Bulova used letters to date the decades of their watches. L, M and N for 1950s, 1960s and 1970s respectively. For this watch, L3 represents 1953. 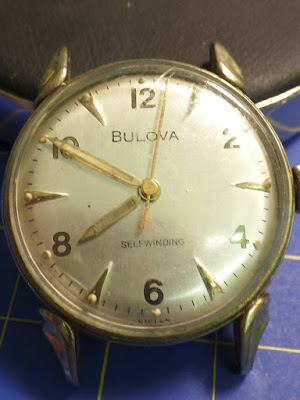 For many collectors matching the case date and movement are important as this likely indicates that the watch and case were put together at the factory and sold as one. Add the original crown, and collectors feel that the watch is more complete. The term Frankenwatch (you know, Frankenstein) is used when the case, movement, dial and other parts aren't original but assembled from a bunch of watches. For more expensive and collectible watches, a buyer has to be careful that it isn't a Franken. The one Bulova with the mystery movement would be a Franken. The picture above is from the inside of the case back. With Gruen watches like this one the series of stamped numbers tell you the watch style (and often associated with a name Gruen marketed it by) and the watch movement caliber. You can also see etched numbers in the photo. These numbers represent dates a watchmaker worked on the watch. 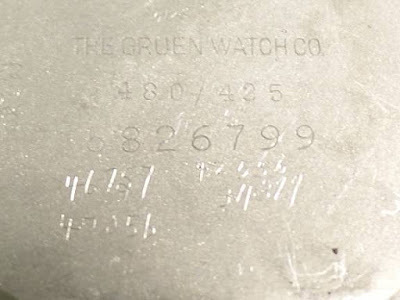 This particular watch appears to have been cared for with all of the watchmaker marks. Should I restore this particular watch, my mark will be added to the history of the watch. 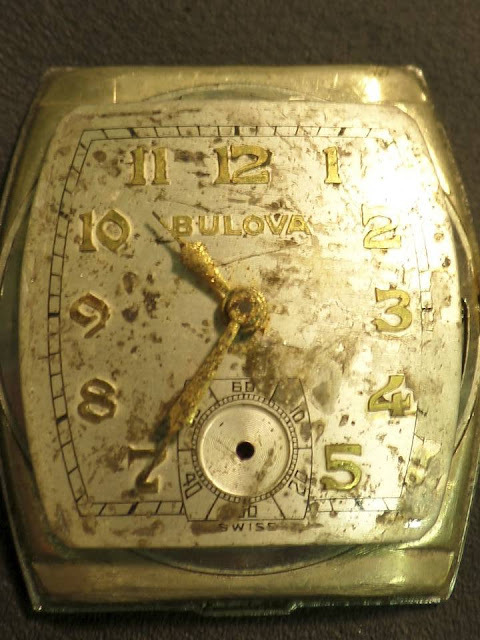 The Bulova in the picture above is a shot of the dial and hands. There is corrosion on the dial and hands indicating moisture likely got into this watch. Interestingly, the movement didn't seem corroded though. 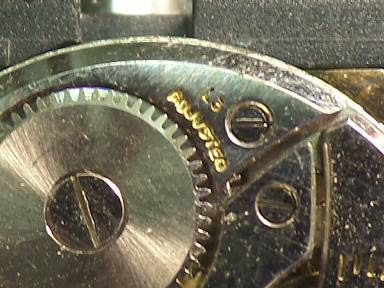 Cleaning the dial is a tricky undertaking and often results in making it worse. You can however get a dial refinished to make it look new like it was when it left the factory. This one I'll see if it can clean up a bit. BTW, with vintage watches, even if they say "waterproof," keep them away from water. Vintage watches were not manufactured like modern waterproof watches today. So in my box of chocolates I had six dating from the 1950s and one watch, the Wittnauer, from 1964. In all, at $25 dollars each (if the $ is what its about and really, it isn't for me) I still came ahead out of the group. Some will likely be candidates for restoration so a quick cleaning of the movement, case and dial, and voila, a resurrected watch waiting for another 60 to 70 years of great enjoyment. This box of chocolate when I think of it, provided some fun, a bit of disappointment when I cursed that I didn't buy the watch when I first saw it, and I found seven new watches to work on or use for spare parts on future watch projects. Not a bad day.